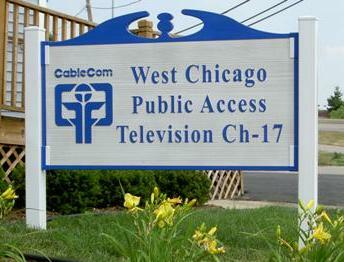 CableCom is the West Chicago Cable Communications Foundation. We are a non-profit, all volunteer organization that has been providing community and government access programming to the residents of West Chicago for over 20 years. CableCom facilities, equipment, and programming slots are available at no cost to certified individuals. Almost all of the programs aired are created by our members -- your friends and neighbors. Looking for a unique way to get involved with your community? CableCom is looking for new volunteers and members to become CableCom Producers. We offer free, hands-on training and simple instruction to use CableCom equipment and facilities to become a Certified Producer or a Contributing Producer. Channel-17 provides the community with a Video Bulletin Board -- a rotating series of computer-generated pages, that informs the community about upcoming events. We provide a list of programs scheduled on Channel-17. Get it on the Air! If you belong to an organization that would like to have an upcoming event covered, you may mail, e-mail or fax us a notice and we will post it. Remember, CableCom is a volunteer-based organization. We do not have news crews and cannot guarantee that your event will be covered. If you want to make sure your event gets broadcast, become a Producer.